You’d think here in the “sunny” South, temperatures would be such that we could be working/playing outdoors all day. Not this year!! Temperatures here in Florida are supposedly going to drop to around 20 degrees tonight. Now, being from Nebraska originally, I understand you all are saying – “what’s your problem? That’s warm compared to our ‘below zero’ temperatures”. Any way you look at it, most of the country is now in a “deep freeze” as the weather people like to say. So, what to do with these long, cold, winter days? As you probably know, I have a set of 8 year old quadruplet grandchildren (along with their big 9 year old brother), and if any of you have children that age, you know their rooms sometimes (most of the time?) need a major cleaning. I’ve checked out several things at Patterns2Go for items to make to try to help them get their rooms organized. Under the Crafts category I found a laundry bag pocket. I’m HOPING this will help get the dirty clothes in one spot and not left in the spot where they took the garment off. And, I’m thinking a Snake Wall Pocket might just help keep some of the smaller things (note pads, pencils, crayons, etc) off the floor. These, and many more items from Patterns2Go take only small pieces or scraps of fabric, so I’m sure I’ll be able to fill these cold days with some sewing projects. We’d love to hear what you’re working on. While you’re checking out free sewing and craft patterns and classes, be sure to check out what’s on PatternsThatFitYou.com and Patterns2Go.com – you’ll find enough goodies to last the rest of the winter! While you’re visiting PatternsThatFitYou.com, you might want to look into all the pattern making classes for women and children — won’t be long before we’re going to be starting on the spring and summer sewing! How can you in sewing businesses help your customers save money? I truly believe this Holiday Season will see fewer gifts given, and those who will be giving gifts will be looking for “deals”. The current economy, where people are losing jobs left and right, where homes are being foreclosed on and where those who DO have a job are seeing their hours drastically cut is making for a bleak Christmas. Where will the extra money come from for those Christmas gifts, party outfits and new Christmas clothes for the kids? One big way that those in sewing businesses can help out, and we’ve touched on this before, is to dig into the scrap boxes! You probably have big enough scraps to make some infant / toddler size dresses, pants and blouses that you can have priced at a very nominal fee. In addition, use those scraps to make a wide variety of toys for all ages, book marks and initial pillows for the teens, all of which can be very nominally priced because you’ve actually just used your “time” in making them, as the scraps are left overs from other paid jobs. If you need ideas for things to make, “Nursery Room Projects” and “Sewing With Leather” can give you ideas, in addition to checking out Patterns2Go for free patterns and cheap patterns that you can use for those toys and other Christmas items. Check out some tutorials at PatternsThatFitYou for additional ideas for projects. After you’ve made a bunch of items, arrange them in your sewing room or customer waiting area, and take a few pictures. Head down to the local newspaper to talk to one of the editors and let them know what YOU’RE doing to help the economy in your area — let them know you’ve made dozens of toys, infant / toddler outfits, etc and have marked them far below regular retail prices. The newspapers are always looking for things to write about for their paper, so you might just get headlined in your daily / weekly paper. If those who have a sewing business or craft business throughout the country would consider doing this type of scrap sewing for affordable gifts their customers can purchase, perhaps it would help ease the effects the economy is throwing at us, and make Christmas a little brighter for some who have no hopes for a Christmas at all. 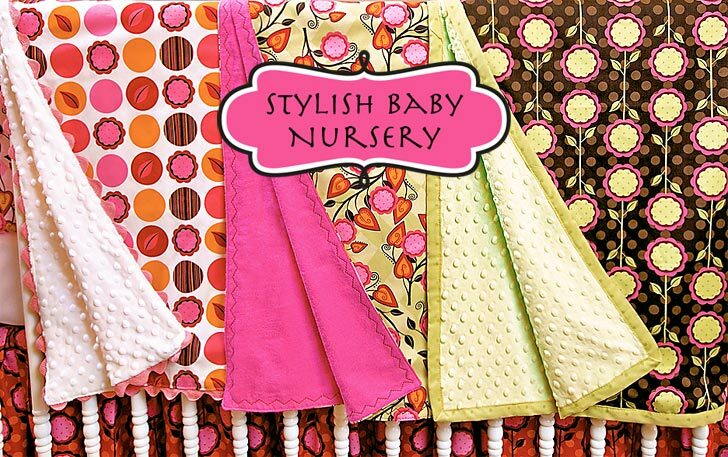 Baby blankets are always popular gifts for baby showers, gifts when the baby comes home from the hospital, and are always nice to have extra ones, so make plenty of them for the new baby. Liz Johnson is the editor of the Sew4Home site, and they have instructions on making three different boutique style baby blankets. These are really cute – here’s a picture, and I’d recommend you check out the instructions and get some made up for the next baby shower. The finishes / edgings on the blankets are really nice. While you’re working on things for the new baby and baby’s nursery, check out the NurseryRoomProjects website and get tons of ideas for additional gifts and decorating.